Kindle Subscription Referrals in Amazon Associates account - How am I getting paid for these Kindle Subscription Referrals? This is cool, I just started noticing these "Kindle Subscription Referrals" showing up in my Amazon Associates account, an account that I track usually daily to see what's selling on Amazon through my links and how much my cut of the sale is for referring those folks to Amazon. Recently, I noticed "Kindle Subscription Referrals" showing up under my miscellaneous referrals. It began February 5, 2011, and has blissfully continued to churn out income nearly every day following that. Thus far it's only been one sale here and three sales there, with Amazon paying a healthy advertising-fee rate of about 10% on each sale, with my cut of the $53.69 revenue being $5.38 so far. But I like to emulate whatever successes happen to me on a small scale and figure out how to exponentially increase them to a larger scale. I wish they did. 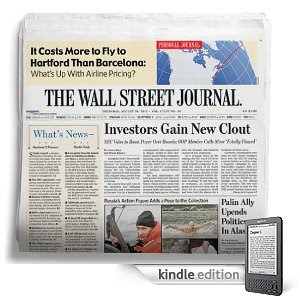 At least they tell us the price of the Kindle Subscription ordered, so perhaps the person who ordered a $14.99 subscription ordered something like the Wall Street Journal on their Kindle, which Amazon lists as the best-selling Kindle newspaper right now. Did Amazon just start paying for Kindle Subscription referrals once again? Did they ever? All of these things just lead me to delve further down the path I'm going: Bless the Lord, oh my soul, that He's taught me how to write Kindle books, how to get my blogs on Kindle, and great ideas for new websites. They are all working in concert, so stay tuned for the income update as it rises, along with my knowledge and organization. No problem. I see you have a lot of blogs. Let me know if you've been receiving Kindle Subscription Referrals payments from Amazon, too. Yeah, I want to get to the bottom of this and make more Kindle subscription sales.